In this parlous time, no serious artist can avoid the question of the relationship between aesthetic commitments and the complexities of an increasingly-political daily discourse. My own solution, for instance, has been to deny politics, particularly war, any real place in my work. However, I fully understand the impulse, and I am always pleased to find someone who wields this sensibility, and its attendant forces, with invention and insight. 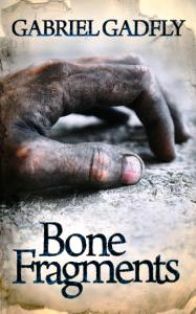 Gabriel Gadfly’s collection Bone Fragments exemplifies precisely that fragile mechanism in which horror and humanity are held in the transformative flux of poetic vision. From the Hesiodic portrait of pre-Hellenic Titans to Homer’s framing device of the Trojan War—and indeed to our own time in which Crane, Owen, and Dickey all discerned new tonalities for speaking of the unspeakable—war has yielded splendidly to the inquiries of those with courage enough to raise the flag of imaginative experience against the grim realities of armed conflict. To be sure, war in all its manifestations is inherently dramaturgical and therefore a seductive subject, but the risks to the poet are many. Aim too high and the language is dishonorably glib, too low and the language becomes exploitative, lurid, even strangely prurient. and I hope to God that’s true. mercy with a lamp and an opium syringe. Here we see Gadfly in his characteristic guise of participant and observer, ironically fused in the logoclasticity of Horace’s Ars Poetica transmuted to an Ars Bellum, glimpsed through the grace of an opiate reverie, revealed in a dream of death. Later, the voice finds a surprising authority in its own fearful resonance: “I ring my heart with a Maginot line, / bristling with the sound and shape of fire.” Thus, Gadfly is his own gadfly, ever engaged in a double game of shooting, and being shot, in the poetic dark. Scott Wilkerson teaches at Columbus State University, is author of the chapbook A Primer for the Minotauric Arts, published by Apocryphal/CreateSpace in Chapbook Vol. One, 2011. His two books of poems, Threading Stone (2009) and Ars Minotaurica (coming March, 2012), are published by New Plains Press.